GitHub is not only home to the code repositories of many well-known open source projects, but it also offers a sophisticated API that opens up wonderful opportunities for snooping around. Hardly a software project today manages without Git. Once you have experienced the performance benefits, SVN will feel like something from the age of stagecoaches. Because GitHub has built a nice UI around this service, which is free and reliably stores your data, and because it's so easy to contribute through pull requests, many developers like myself swear by the San Francisco-based Git hoster. Over the years, 57 publicly visible repositories have accumulated in my account; most contain CPAN modules, but more esoteric content like the text data for my blog usarundbrief.com is also stored there . You can dig up some interesting facts by messing around in the associated metadata with Perl. Especially in the context of automatic build systems, it's essential that access to the metadata in the Git repositories not be exclusively browser-based. Instead, automated scripts leverage APIs to retrieve everything you need from the cornucopia of data. To control this in Perl, the Net::GitHub collection of modules by Fayland Lam is available on CPAN. Equipped with the necessary access privileges, the API user can both access (Figure 1) and actively modify programs, say, by adding some new code. 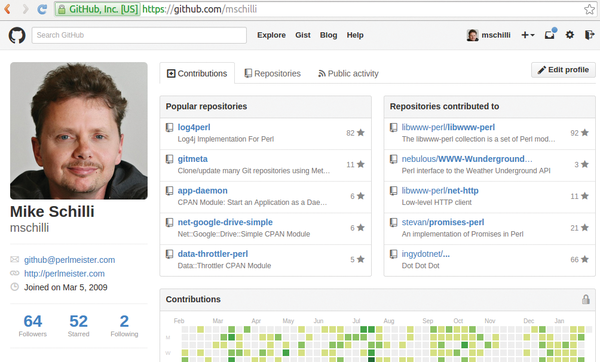 Figure 1: The author page on GitHub lists your own repositories and contributions to other repositories. The API offers very similar abilities. For GitHub to know who issues API requests and to intervene with corrective action where needed, an optional authentication token is included with each request to the REST API. Users can pick this up in the browser UI or from a script, as shown in Listing 1 . It prompts you for your password, then uses SSL to send the data to the GitHub server, and receives an access token in exchange. carries out the necessary steps for the user stored in line 11. You'll have to adapt the string to your own GitHub account user ID. You need to watch out for the note comment value; it must have different content for each newly requested token when you call the create_authorization() method. Otherwise, GitHub will refuse to issue the token and report an incorrect user/password combination as the cause. The real reason, however, is that GitHub lists the tokens keyed by this note value on the user's account page, where you can modify or revoke the tokens (Figure 2), and the notes must be unique for each token. Figure 2: The GitHub page lists all previously generated access tokens. Additionally, the scope parameter defines what rights the account owner grants to prospective clients. If it is left empty – as in Listing 1 – the server only allows read access to publicly available files . In contrast, one or more entries like user or repo in the scope array later give users read/write access to data (e.g., to change their email address) or code commits. 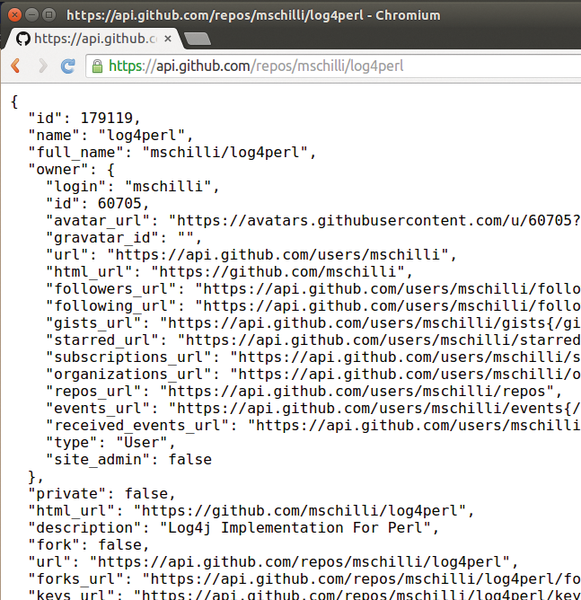 Figure 3: Even without the auth token, the GitHub API reveals information about repos or users. The number of requests permitted before the server slams the door is included in the HTTP header of the response. Figure 4 shows an example of the command without a token, in which seven queries were sent in the current hour, and 53 thus remain. Figure 4: Sixty requests are allowed per hour; the client has another 53 left before the server resets the counter at the specified time. The repo-user script amazingly revealed that Linus Torvalds has created only two repositories on GitHub! Lines 9 and 12 in Listing 2 grab the access token stored previously by Listing 1, and the method chain ->user->show() accesses the user's account information on GitHub while providing the token. The example in Listing 3 determines which repositories an author already created on GitHub; this is done by extracting and outputting the repository name strings from the returned metadata. Instead of using list(), you could use the list_user() method, which takes a username (Figure 5); if you pass it the string torvalds, you see that the Linux creator's two repositories are named linux and subsurface. Figure 5: Listing 3 outputs all the user's GitHub repositories. GitHub limits the number of results returned by the server to 100 by default. If you want more, you can increase the pagination size of the returned data with the per_page parameter. Or, as shown in Listing 4, you can ask whether there are more results for the query after the first packet of 100 has been returned, using has_next_page(). If this is the case, a subsequent call to next_page() dumps the next cartful of data into the search object (see Listing 4). The script sets the sort search parameter in line 14 to stars, together with a value of desc (for descending) so that the result is sorted by popularity of matching repositories. If you are interested in a project on GitHub, you can click on its star icon to keep up with its progress. The number of stars on a given project is an indication of how popular a project is. In a query result, the number of stars on the project is given in the stargazers_count field, and the name of the project can be found in full_name. to the new() method of the Net::GitHub class; then, you will receive information from this source instead. show that the code in the Log4perl repository has two files with occurrences of the word snickers and prove that the author not only uses the names of tasty candy bars in programming examples but also has a tendency toward oddball humor. A new service on travis-ci.org picks up GitHub projects, runs new code through test suites, and notifies the owners if the build fails. Its API enables Perl scripts to gather historical build data, including who-broke-the-build tabulations.